At Castlegate Security we are able to provide a mobile patrol service throughout North Lancashire and South Cumbria. All visits are recorded via the latest electronic tagging system, which can be easily reviewed by the customer the following day and by location verification from our GPS system. Mobile patrol visits can be utilised for a multitude of reasons, not just for security checks. For example, these include welfare checks on lone workers and checks on equipment and process plant. Vacant property inspections are an example of how our mobile patrols can be used to monitor your assets, especially in winter. With low temperatures and adverse weather conditions, workers and equipment can be at risk. To find out more about our Mobile Patrol, GPS System, or Vacant Property Inspections, call us today on 08453 102010. 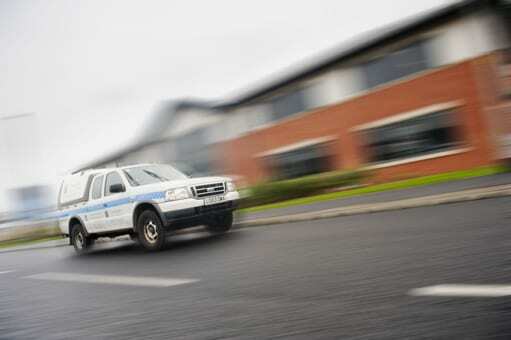 How Are Security Mobile Patrols Carried Out? With 4×4 vehicles in our fleet, we can assure that even during the worst weather conditions we can respond to any alarm activation as quickly and safely as possible. During times of floods and heavy snowfall, we have never missed attending to a response call. As we are located near to the Lake District and Cumbrian hills, we have customers in remote locations with challenging access even in good weather. Fully vetted and SIA licenced, our security guards attend a variety of emergencies. They act as deterrents against crime whilst defending your assets and premises. Visibility is extremely important, which is why our mobile security officer will be fully high-vis uniformed and in a clearly marked patrol vehicle. With a variety of security solutions on offer, we can design our packages to suit your needs. Regardless of whether your premises require hourly visits or even random patrols, Castlegate Security will deliver security effectively and successfully.